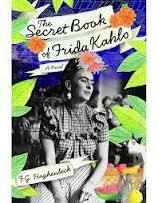 I am hosting the August/September round for Cook the Books featuring F.G. Haghenbeck’s The Secret Book of Frida Kahlo. This historical novel is based on several notebooks allegedly discovered in Kahlo’s Coyoacán home. One of these notebooks, entitled by Kahlo as “The Hierba Santa Book” or The Sacred Herbs book is filled with her memories, recipes and musings. The Secret Book chronicles Kahlo’s life from the catastrophic trolley accident of her youth through her tumultuous relationship with Diego Rivera. Along the way, Haghenbeck shares Kahlo’s recipes from the Heirba Santa book in a mystical chronicling of her wonderful yet tragic life. Each chapter includes at least one reflective recipe like “Horchata and Corn Gorditas” for Day of the Dead offerings. I almost revisited Chiles en Nogada that I made for a previous post on Like Water for Chocolate (which reminded me a lot of this novel). Lupe, Diego’s ex-wife, teaches Kahlo to make these in Chapter IX. 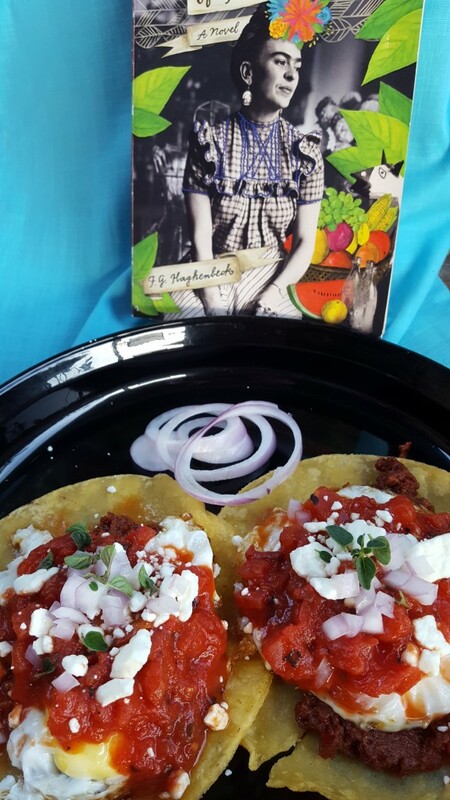 Kahlo found herself among the most famous artists, art patrons, writers and intelligentsia of her time and these were the recipes and stories that intrigued me the most. Of course, there were lots of dishes for Diego, between marriages and affairs. I was most struck by Haghenbeck’s version of her meeting with Picasso. Picasso’s singing was pleasant. Frida loved his serenade. ‘If you teach that to me, I’ll sing you Mexican songs. The kind in which pain bubbles up from the soul. And if we’re still up at dawn, I’ll prepare you a Mexican breakfast. 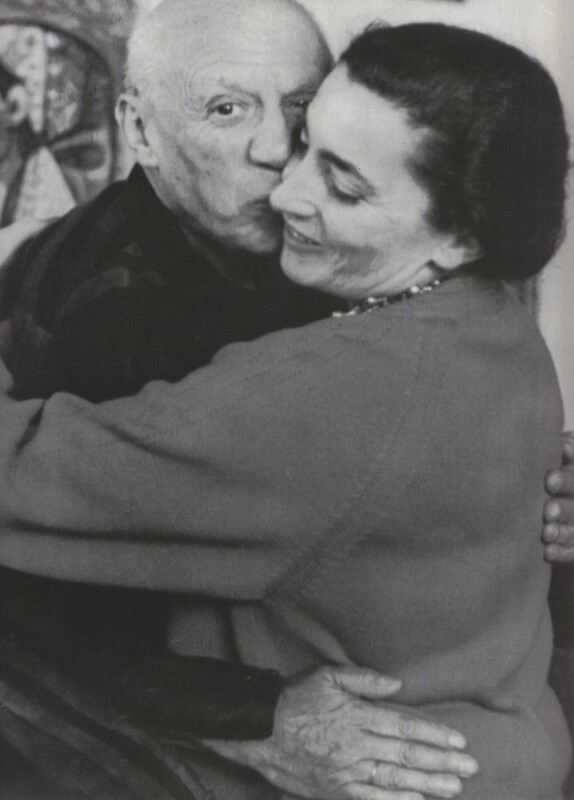 I’ll make enchiladas and yellow beans,’ Frida said, and Picasso agreed with a nod of the head. Although I think a competent cook could follow the recipes that end each chapter, there is a disclaimer in the book about the included recipes. The editors tacked on a few more traditionally written recipes at the end of the book. That being said, I mostly followed the recipe that commemorated her Mexican breakfast with Pablo Picasso. What I miss most when I’m traveling is getting up in the morning to the smell of coffee with cinnamon and something good frying on the stove for breakfast. It’s the start of a new day, and a reminder of how marvelous yesterday was. Here is my revision of a Mexican Breakfast with Picasso. I added chorizo, cojita, and red onions. Cook chorizo then drain on paper towels. While chorizo is cooking, heat olive oil in a small sauce pan over medium heat. Add garlic and red pepper flake and saute for 1-2 minutes. Do not burn. Add tomatoes and oregano and simmer while the rest of the dish is completed. In a medium skillet, heat canola oil. Cook the corn tortillas for a few seconds until soft and remove to a paper towel-lined plate. Reduce heat and then fry the eggs in the oil, making sure not to break the yolk. Place the drained tortillas on two serving plates. Divide and spread chorizo on top of the tortillas. Place an egg on each tortilla. Divide and pour tomato mixture over the eggs. Garnish with red onions and cojita. This recipe serves two, just like Kahlo would have served it to Picasso. There were sugared breads-for-the-dead surrounded by bright and splendorous orange flowers. And there was also a menu consisting of the most delicious dishes from her own repertoire: Lupe’s chiles rellenos, the dear doctor’s ribs, Tina’s tiramisu, ice cream from Tepozteco, Eva’s apple pie, Mama Matilde’s shortbread, the mole poblano from her wedding, Mati’s soups, Covarrubias’s pipián, and, in the place of honor, the tamale with heirba santa, steaming as if it were still in the pot. Some of her final thoughts are fused with remembrances and food. You still have time to participate in Cook the Books. 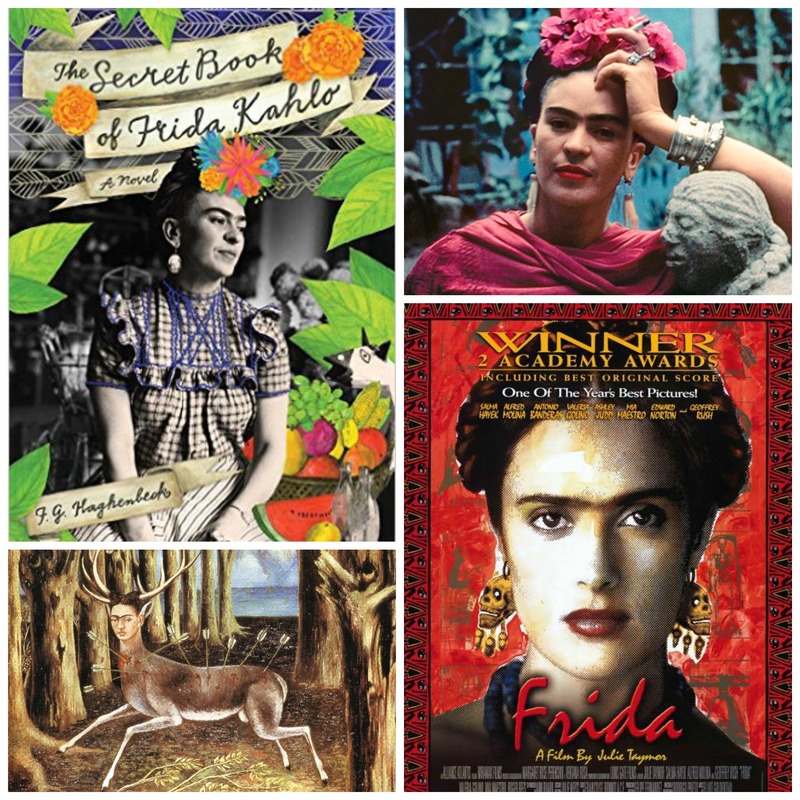 Find a copy of The Secret Book and whip up a Frida-inspired dish. Deadline for posting is September 30. For more information, check out the Cook the Books announcement post. Also, please consider participating in the joint Frida event with Food ‘n Flix. I am also hosting the September Food ‘n Flix round featuring Frida. Obviously, I have an obsession with Kahlo’s life and works (you can read more about it here) . We recently visited the Gilcrease Museum of Art in Tulsa to view an exhibit of photographic portraits of Kahlo by Nickolas Muray. (You can read about our artsy adventures here.) I also sought out Frida’s Fiesta and am now a proud owner of this cookbook by one of Diego’s daughters. Since the Food ‘n Flix September edition features the film Frida, I am planning on utilizing Frida’s Fiestas for that event. You can also check out my review of The Secret Book at GoodReads. In my very early twenties, I was exposed to Kahlo’s works at an exhibition at SMU. I was enthralled. I too have an obsession with Frida. I’ve only seen one of her pieces in real life. A small piece at the Denver Art Museum. Thanks for this post, I must get the book. I will have to see that piece when I’m there next! Sounds like a terrific book! What a neat lady she was. And what a breakfast this is — although I think I’d be tempted to have it for lunch or dinner (just can’t eat that much early in the morning). Really fun post — thanks. The food mentioned sounds terrific. You certainly are a #1 fan of Frida. I went t a Frida event a couple of weeks ago and there were lots of people with drawn in eye brows. I love Frieda – the art and her story! This breakfast is one I’m sure she’d love. It’s one of my favorite things to order at brunch in SoCal. I’ll have to make it at home! Me, too (obviously). I couldn’t help but add the chorizo and cojita! I love a good Mexican breakfast! My dad used to make them for us as he was from New Mexico. Yours looks as delicious as his – YUM! Huevos Rancheros is our favorite breakfast and we’ll always changing it up a bit here and there. Love you version and so perfect for this flix. I adore discovering this art lover side of you in these last posts! Seeing the movie this weekend while on a plane for FnF, looking forward to it. 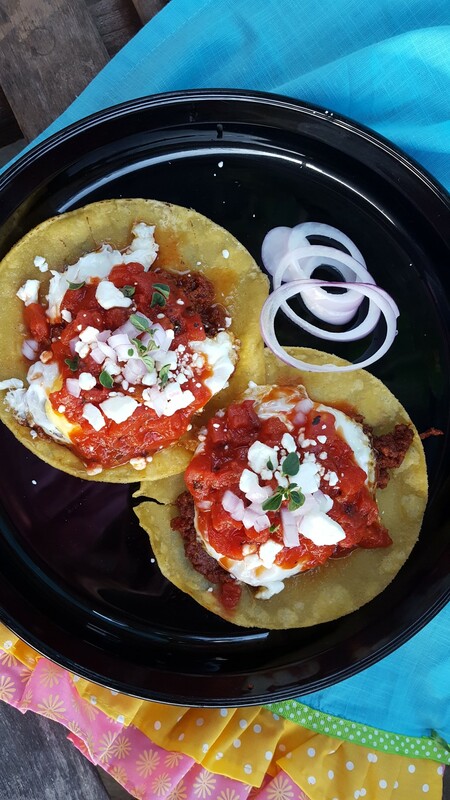 I love your twist on huevos rancheros. An intriguing novel and glimpse into the heart of an artist. I love a good Mexican breakfast and yours hits all the high notes! I remember some good ones, staying in a little place in Mexico City, with fresh squeezed orange juice. Thanks for persevering through the novel, Claudia! 🙂 I would love to hear more about your Mexico City jaunt. Thanks so much for hosting both events and choosing Frida as the topic. Do you believe I have never tried Huevos Rancheros? Sometimes I think I live under a rock. You must whip up some for breakfast, brunch, or brinner, Wendy! Yum! Great recipe! I very nearly made the same thing – now i need to try your recipe! The chorizo makes all the difference in this, Amy. I was surprised at all the diversity of the dishes. I really thought we would have a few more repeats. (Especially with Frida.